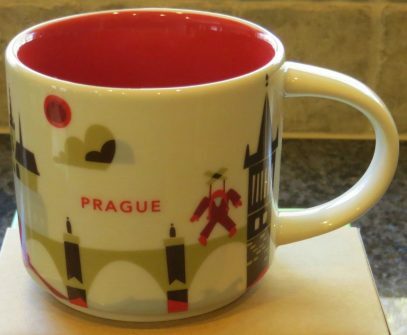 It is hard to believe but this brand new Prague mug is a third one from You Are Here series released in 2 days. And first YAH mug for Czech Republic. By looking at the mug we can see Old Town Hall located in Old Town Square – a historic square in the heart of Old City of Prague. The most significant element of the Old Town Hall is obviously Prague astronomical clock, or Prague Orloj. It was built in 1410 and remains the oldest operating astronomical clock in the world. It’s three components are: astronomical dial, moving figures (each hour) and a calendar dial with medallions representing the months. Other elements of the mug’s design are: Charles Bridge, a marionette – referring to National Marionette Theatre and accordion for International Accordion Days in Prague . I am really surprised there are no beer related elements on this mug, but they probably saved that for other mugs from Czech Republic.